You spend so much time in bathrooms, bedrooms, and basements that you might not even think of the doors into these rooms as what they are. So here is some more information about what to think about when it’s time to update interior door hardware. Although changing the hardware on your home’s front door is important, you can’t forget about the hardware on the doors inside your home as well. You spend so much time in bathrooms, bedrooms, and basements that you might not even think of the doors into these rooms as what they are. So here is some more information about what to think about when it’s time to update interior door hardware. These are the knobs commonly found on hallway doors or closet doors. Since these doors don’t need to have locks on them, they won’t have the necessary key cylinders or lock buttons on them. As the intended purpose of these doors is frequent access, you don’t need to worry about putting locks on them. In general, they are better suited for pantries, storage rooms, laundry rooms, and playrooms. Interior door hardware can serve more than one purpose. One example of this is when you use a dummy knob. That’s because these knobs help to make the doors they serve more aesthetically pleasing. When two doors are close to one another, it makes sense to put a dummy knob on one. You’ll notice that these are surface-mounted and set on the side where only one side needs to be able to open. 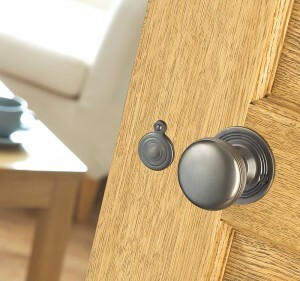 Keyed knobs are another type of interior door hardware. You would expect to find these on exterior doors that use doorknobs, but they can be used indoors as well. When you need as much security as possible, that is when you use to install these knobs. If anyone wants to open these doors when they are locked, they will need a key. Keyed knobs are useful for bedrooms and terrace doors, especially for patios that do not have sliding glass doors attached to them. These doors become even more secure when one side has one kind of lock, and the other has a different lock, which then means two different keys are needed to access the door. Privacy knobs are somewhat similar to keyed knobs. However, these knobs can only be opened from one side at a time. That’s why they’re often used for bathroom doors, to give the occupant more privacy than just closing the door can give. Homeowners can also use these knobs on bedrooms and guestrooms. Glass, wood, ceramic, plastic, brass and metallic finishes are used for these knobs. The kind of knob you choose is up to you! No matter what type of front door hardware and entry locks you choose, WalterWorks Hardware has the expertise and supplies you need. We are well known through the Maryland, Washington, D.C., and northern Virginia area for our fantastic hardware and unbeatable knowledge. For more information, please call us at (410) 263-9711 or contact us online. For more tips on choosing hardware for your home, follow us on Facebook, Twitter, LinkedIn, Houzz, and Pinterest. This entry was posted on Friday, April 5th, 2019 at 9:33 am. Both comments and pings are currently closed.